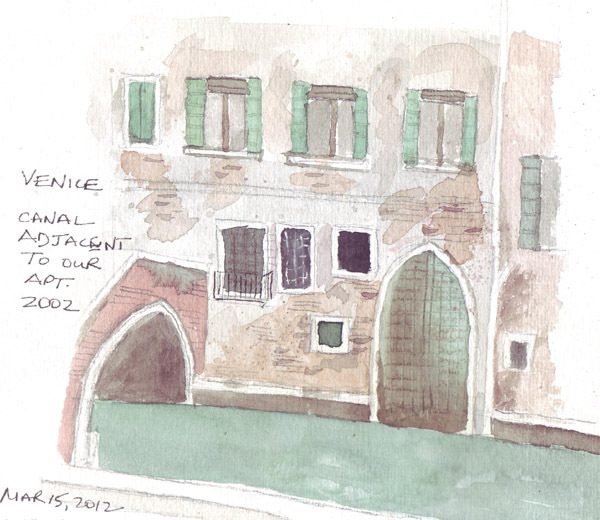 I resumed my drawing/painting practice this week for our Spring trip to Venice. The Print Studio at MoMA consumed all of my attention during much of February and the first week in March, pushing Venice down my priority list. I was concerned that I had no idea how to capture the wonderful patina and aging of the buildings, with exposed bricks and so many age spots. Last week, Kate Johnson, in the videos from the second week of her Strathmore Workshop, demonstrated watercolor techniques that were perfect for me to try and yesterday I did my first painting of a very aged building from one of my 2002 photos. 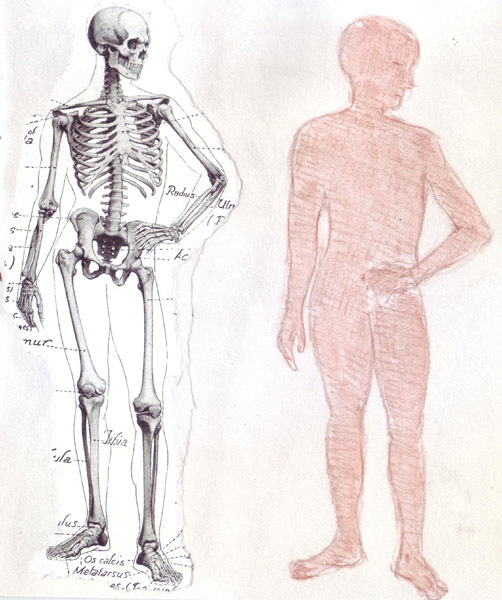 Cathy (Kate) Johnson is a master of watercolor and author of many books. She is extremely generous with her knowledge and shares so much with those of us who follow her website and blog, buy her books, and take her online classes. I LOVE her free online Strathmore workshop and hope that everyone knows that she is the teacher for March. You can register and access the 4 weekly classes until August. In this small painting, I used wax paper, dripping, and spatter - with some blotting to try to get the changes in surface texture that I wanted. I had a wonderful time drawing last night. The weather was beautiful all day. The wine was great, the 3 piece jazz band set a mellow background ambeience, and I loved the models' challenging poses. Some days the process is just so much fun. I was most pleased with the fast poses last night and will just upload them - skipping the 2 twenty minute poses until later. It always gives me great pleasure when I can "just do it." 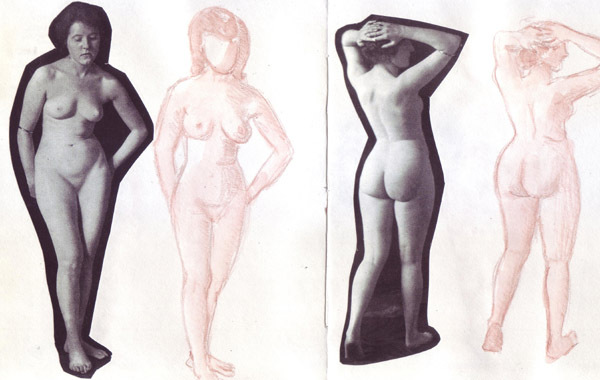 Four 5-minute poses: It was amazing that the model could actually hold the last pose you'll see for a full 5 minutes. I am very sad that the Print Studio ended today. It was an amazing resource for artists/visitors and each of us felt that it was the perfect environment for artistic play. 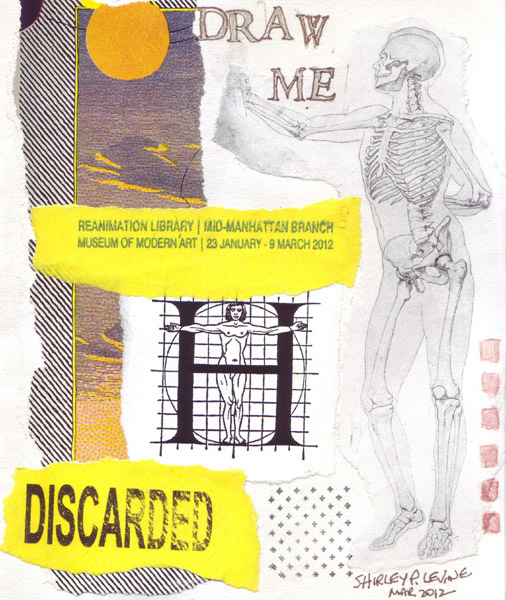 The Reanimation Library provided the inspiration. 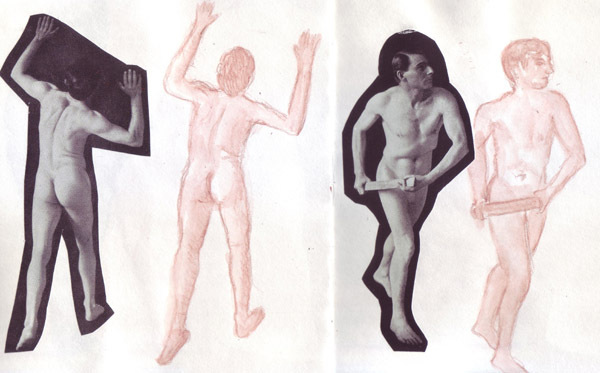 The images that were available in the 35+ shelves of books stimulated so many ideas and the copiers, scanners, and computers with Photoshop software permitted artists to experiment in many different ways. I made my eighth 8-page pamphlet book on Monday - this one entitled The Mystique of the Alphabet. 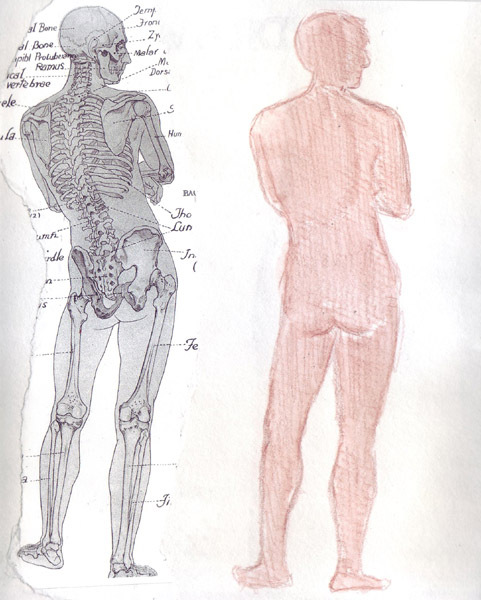 On Wednesday I decided that it was time to do some drawing - and made a book with figure illustrations for me to draw. On Thursday I added collages to the altered book that I started in the workshop they had several weeks ago. New friends were made and I shall miss them as we begin withdrawal and catch up on the rest of our life. Here are the pages from my book entitled "Draw Me." 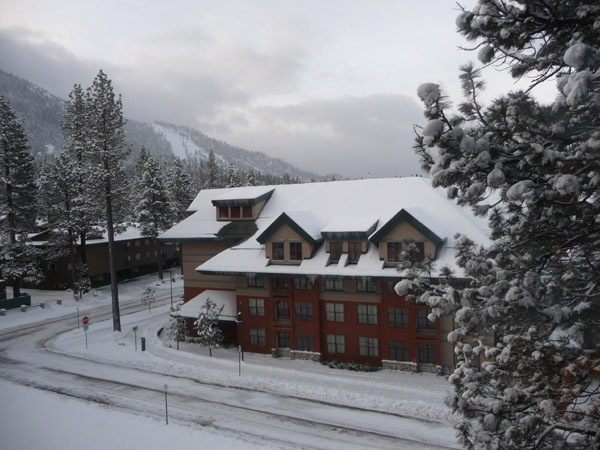 We had 3 days of snow in Lake Tahoe - glorious for us because we took walks around the town and down to the Lake. 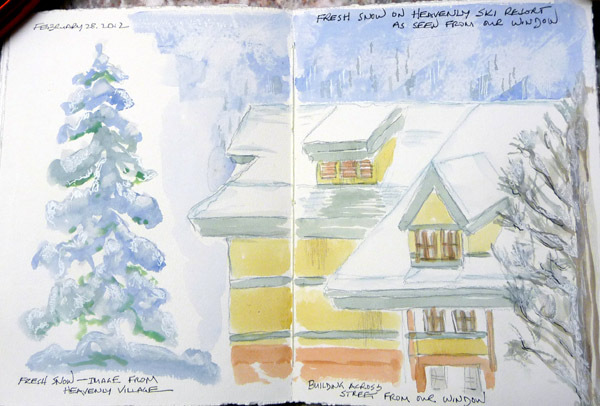 The snow, and especially the wind, prevented me from doing any sketches that weren't from our hotel window. 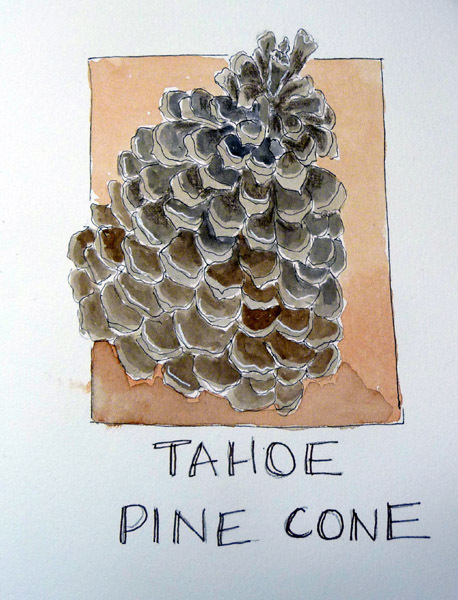 But I brought in one of the largest pine cones I ever saw and added that to my sketchbook after it dried out. 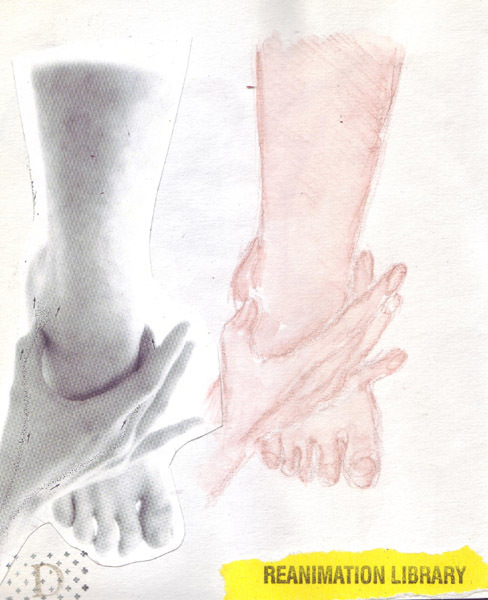 These sketchbook images were taken with my camera and not scanned, so the contrast had to be adjusted. Today we are going to be in San Francisco, and tomorrow we return to NYC. 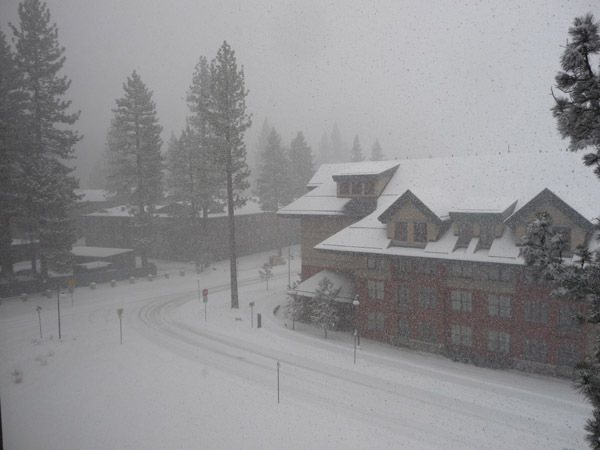 We are in South Lake Tahoe for the week, and I was finally able to walk in the snow this year. I took a long walk yesterday morning through Heavenly Village - when the snow was so heavy that the mountains disappeared from view. 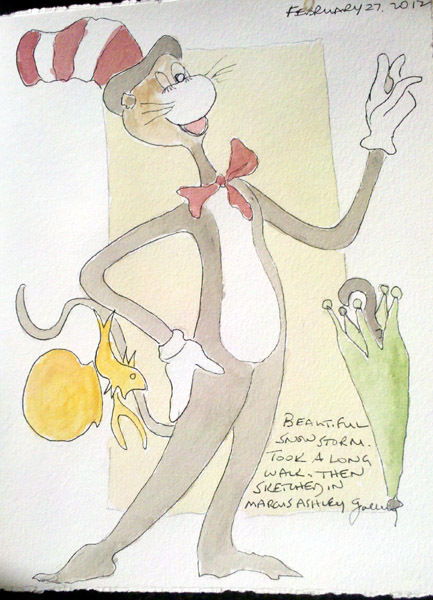 I stopped in the Marcus Ashley Art Gallery when I looked almost like the abominable snowman in my white parka, and found a fabulous Dr. Seuss Art Collection. When I was asked if I had any questions, I confessed that my only question was "Can I sketch one of these fabulous little figures?" 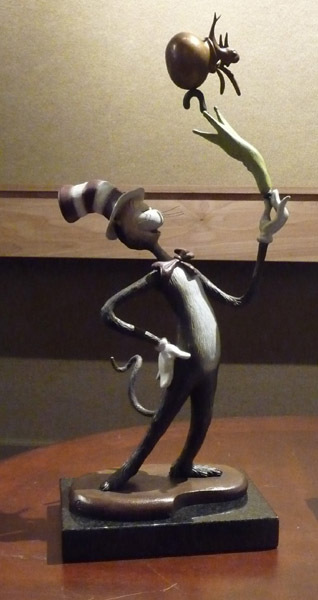 Not only was sketching permitted, but the Cat in the Hat was put in the viewing area and I was offered a mimosa, or wine, or coffee while I sat and drew the figure! It was 11:30 AM, so I declined the alcohol!